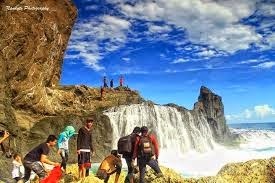 There are a lot of unusual place we could find in Lombok Island. 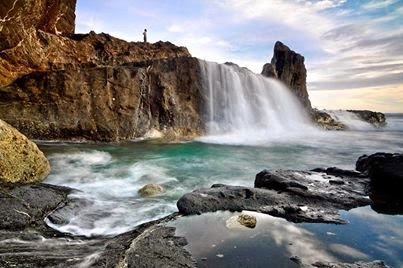 One of them is the salty waterfall located in Nambung Beach, West Lombok, West Nusa Tenggara. Nambung Pengantap Buwun beach located in Golden, village, district Senggigi, West Lombok. Travel can be reached by car or motorcycle for two hours. 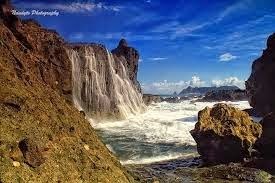 The location of this salty waterfall is in the end of Nambung beach. To reach it, we must walk along the sand and rocks on the coast of Nambung. Although the distance to the location is not too far away. Visitors must pass through sand like grains of pepper that makes the legs feel heavy. Similarly, when passing through the rocks, visitors are expected to be careful because it is quite prone to cause injury. Beside walking, there are also another alternatives to reach this location. Visitors can hire a boat belonging to local fisherman to reach the waterfall. Simply spend Rp 10,000 and you can enjoy the surroundings while boating Nambung Beach. If the beach receding, behind the rock cliff of Nambung beach you will find natural pool located in the middle of the rock ranks, you will find the Salty waterfall there. This sensation of salty waterfall has been Widely Discussed in the internet, no wonder if many people are curious and want to see this place. Despite having to go through heavy terrain, but fatigue will be paid off with this charming natural scenery.